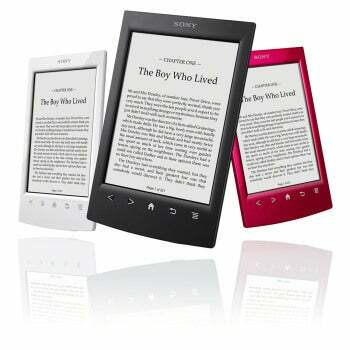 Sony has unveiled the Sony Reader PRS-T2, a touchscreen-enabled follow-up to the low-priced PRS-T1 that debuted in late 2011. Sony’s latest addition to the PRS-T lineup features new social features for Facebook and Evernote, improved page turns, simplified home screen, improved battery life, and one additional font size compared to its predecessor. The device comes in white, red, and matte black, costs $130 and, at least at launch, includes a voucher to get the e-book version of Harry Potter and the Sorcerer’s Stone. As with the PRS-T1, the PRS-T2 features a 6-inch display, 2GB storage, and an included stylus for jotting down notes in your e-books. The PRS-T2 also has the same physical button layout as the PRS-T1 for those times when you don’t want to use the touchscreen. But this time, the buttons are shaped as the icons they represent instead of a row of similar-sized buttons. The overall physical design refresh gives the PRS-T2 a much sleeker look than its predecessor. Sony says the PRS-T2 will provide users with up to two months of battery life (with the wireless off), about a three-week jump from the PRS-T1’s five weeks. If you want to get social and share what you’re reading, the PRS-T2 allows you to share book quotes and cover art on Facebook. Sony did not specify how long the Facebook quote could be. You can also use the PRS-T2 to check out web clippings you’ve saved to Evernote. And if you use Evernote Clearly, the Web service’s Instapaper clone, your plain text articles will be optimized for reading on the PRS-T2’s E-Ink Pearl V220 touchscreen display. As with previous Sony Readers, you can grab new books from the Reader Store or you can borrow e-books from more than 15,000 U.S. public libraries — as long as you have a valid U.S. library card.